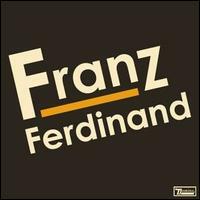 Prior to becoming synonymous with a great indie rock hope, Franz Ferdinand was best known as the mustachioed heir to the Austro-Hungarian Empire whose 1914 assassination marked the beginning of the First World War. A vain and mistrusting man with minimal charisma, his fate was sealed at the hands of Gavrilo Princip, a Serbian terrorist outraged at Austria's 1908 annexation of Bosnia and Herzegovina. 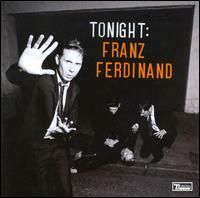 What exactly the aforementioned history has to do with Franz Ferdinand the Scottish rock band is up for debate, except for the fact that the amount of hype they've received as of late may have the potential to set off a (major label bidding) war the likes of which we've never seen since Le Strokes ended up on RCA. Word on the street is that Franz Ferdinand sound like a combination of The Strokes and Interpol, and were you only to listen to the EP's title track, you'd be hard pressed to disagree. "Darts of Pleasure" glides by on a metronomic drum beat that could easily pass for a Fabrizio Moretti riff, the bass player doesn't have to work too hard, and Alex Kaprano sings with a hipster croon that will certainly call Paul Banks to mind (albeit a goofier, more sarcastic version). But tracks two and three hint at welcome variety; "Van Tango" is a glam stomper complemented by big swingin' drums and what sounds like a broken farfisa organ, while the Monster Mash-influenced "Shopping for Blood" could pass for a Cramps song. Of the "home demo" tracks, I wouldn't blink if you told me that "Tell Her Tonight" was pre-DFA Rapture, and the crappier production on the demo version of the title track has the amusing effect of making it sound even more like a Strokes song. With Darts of Pleasure, Franz Ferdinand has accomplished the formidable task of writing four (five with the title demo) extremely catchy songs that fit into the current hype matrix nicely. Parts of it absolutely warrant the Interpol/Strokes comparison, there are welcome aspects of modern dance-punk, and if their website photos are any indication, they're cute guys with matching bowl haircuts. Also welcome is the fact that the band appears to take themselves far less seriously than most of the groups they're lumped in with, as evidenced by the rambling (and hilarious) band history on their website detailing their run-ins with the law and establishing that Franz Ferdinand was created for the sole purpose of making "music girls can dance to." Add a live show last November that my CMJ spies tell me was completely on fire, and you're left with a band whose upcoming LP (February 2004 in the UK) carries considerably weighty expectations. We all stand to benefit if they're up to the task.